This Easel Display Folds for Straightforward Transport! The Dual Action Design Allows the Holder to be Set on the Floor or on a Table Top! 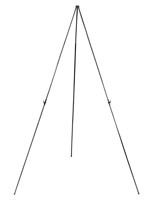 This is Where to Get an Easel Display on the Cheap! 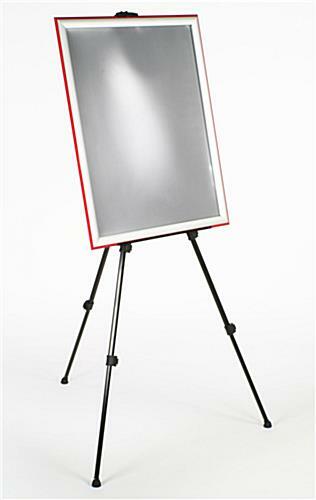 This easel display is a multi-purpose stand, perfect for exhibitions, product promotions and office presentations! 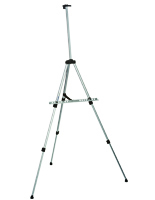 Compare this dual-design tripod stand to any other aluminum easel in the $40.00 price range! 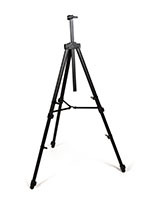 The adjustable stand, easel display collapses into an easy-to-carry tripod you can take anywhere! The portable unit can even be used as a countertop ensemble, at approximately 22-inches tall! 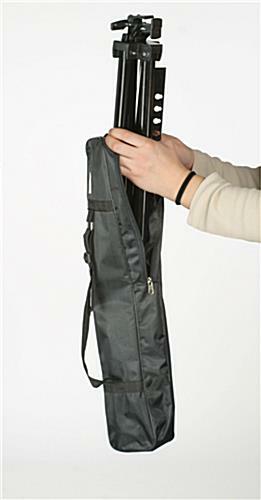 We even provide the easel display with its own nylon carry case with strap. This compact unit will fit nicely into a suitcase or car trunk. 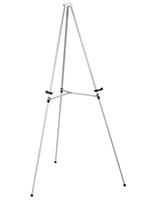 This easel display, also known as a portable tripod, features (3) telescoping legs, allowing users to change the height of a presentation. Simply slide the legs into the desired position and lock in place. 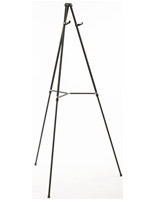 This easel display is made of a strong aluminum, and has a smooth, neutral black finish. This basic coloring will complement pictures or postings without detracting from the items on exhibit. 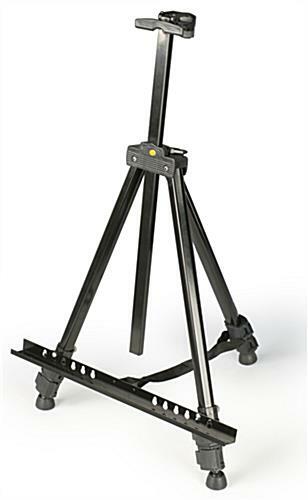 The tripod stand, easel display features (6) keyholes on each side of its metal tray, allowing you to alter the width of the tripod's stance. 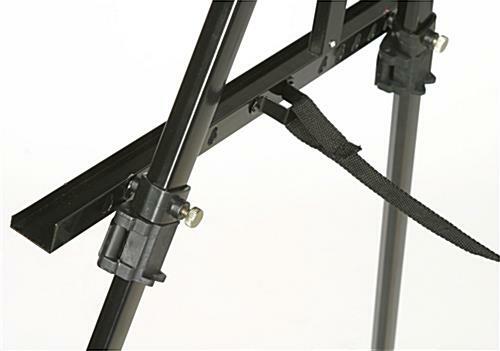 The easel also features a nylon belt for extra stabilization. 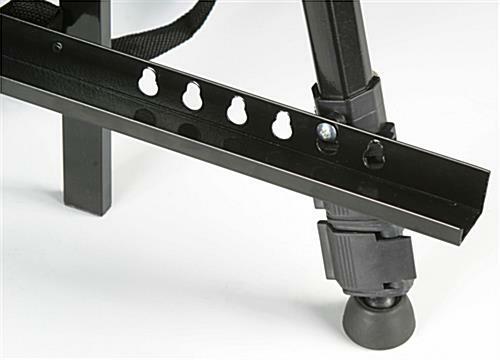 The easel display, such as many of our other portable stands, has a spring-loaded clamp to secure your poster or frame in place. 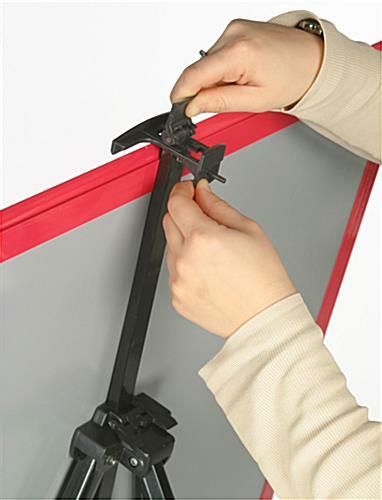 The heavy-duty clamp also has an adjustable height, giving a user the option to display a variety of poster sizes, ranging from 16-1/2" high to approximately 28" high. 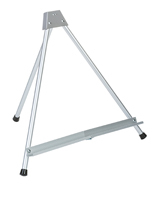 This presentation stand is a great easel display for professors, tradeshow participants and traveling salesmen. 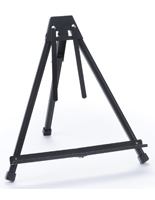 Please Note: This easel has height restrictions and can only hold up to a 28"h graphic frame. 38.3" x 64.5" x 34.0"
16.5" x 21.5" x 14.0"
16.5" x 1.0" x 1.3"